“Islamic” legislation stirs debate as the PRC engages the Muslim world. of China (PRC) and General Secretary of the Chinese Communist Party (CCP or Party), has embarked on a number of trans-regional economic and security measures to align China’s interests with those of Muslim-majority states in South Asia, Central Asia, and the Middle East. Last year, Xi pledged $46 billion to the China-Pakistan Economic Corridor (CPEC) that will create infrastructural ties between the two countries. The hallmark of China’s re-engagement with the Muslim world is Xi’s “One Belt, One Road” initiative, which includes not only CPEC, but also the China-Central Asia-West Asia Economic Corridor. While China has ambitiously pursued commercial relations with Muslim states, it has, at the same time, sought to limit the influence of Islam in China. Such tailored foreign policy has had mixed impacts on the country’s 23 million Muslims, including Chinese Muslims (Hui) and Turkic Muslims (Uyghurs). On the one hand, interaction between China’s Muslims and co-religionists abroad has intensified through business, pilgrimage, and intellectual exchange. In conducting research on China’s question over the past decade, I have seen signs of revival throughout China: the construction of mosques and madrasas, the popularization of conservative head-coverings, increasing translations of Arabic and Farsi works, and the spread of Islamic media. Hui, in particular, have benefited from new economic links with Gulf States, attracting investment and aid dollars. On the other hand, restrictions in Xinjiang continue to hamper Uyghurs’ ability to interact with co-religionists across the border, particularly following the deadly riots in 2009 in Urumqi and terrorist attacks in Beijing in 2013 and Kunming in 2014. As a result of this violence, security forces have restricted domestic and cross-border movement of Muslims. The halal food industry highlights the contradictions between China’s external opening and domestic tightening. Hui, in particular, have been keen to access the global halal market, valued at $1.4 trillion per annum. The central government views halal food production as a win-win situation: a relatively innocuous vehicle for Hui – foreign Muslim engagement that would boost local economies and permit Hui to capitalize on their membership in the global community of Muslims. The Ningxia Hui Autonomous Region (“Ningxia”) has become a center for halal food production. According to a report by the Ningxia Academy of Social Sciences, by 2010, the total volume of sales in halal goods in the region exceeded $1.5 billion. Through government subsidies and tax-free zones, Ningxia Hui have sought to increase trade between the region and the Middle East through halal foodstuffs. By 2010, Ningxia Hui were exporting over $1 million worth of halal food per annum to Malaysia, the UAE, Qatar, and Egypt. It would seem that qingzhen (Chinese for “halal”), which anthropologist Dru Gladney called the “sacred symbol” of Hui that can be seen on restaurants, grocery stores, and even barber shops in the northwest, has received the imprimatur of the government. In China’s multi-ethnic northwest, qingzhen is a kind of taboo, marking the Hui minority from the Han majority. Yet taboos, as another anthropologist, the late Mary Douglas, instructed, are dangerous. The relatively successful story of halal “made in China,” has become marked by scandal. Over the last month, academic, policy, and popular circles have been seized by a debate about the constitutionality of a law on halal food. As early as 2002, the State Council had entrusted the Ethnic Affairs Committee of the National People’s Congress (NPC) with the task of drafting legislation to regulate halal food production. The demand occurred a year after China acceded to the World Trade Organization that stipulates rules regarding food safety, specifically the Agreement on Technical Barriers to Trade. 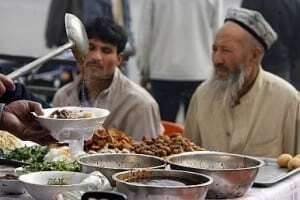 According to a 2006 report commissioned by the State Ethnic Affairs Commission (SEAC), an organ that sets policies toward ethnic and religious minorities, some 29 provincial and municipal governments have enacted regulations for halal food. However, there is no nation-wide piece of legislation – keeping Hui from establishing halal food companies and participating in China’s engagement with Muslim states. According to Li Ziran, the head of the Halal Industry Development Research Center at Ningxia University, “In recent years, domestically, over 1,000 companies through different approaches have successfully obtained the symbol of authenticity [to make] overseas halal products. But as for nation-wide halal enterprise teams, these numbers are quite small.” In the course of my fieldwork, I encountered several instances where so-called halal food was produced, but did not meet the requirements of sharia. For instance, pork was used in its making, which led to Hui protest and inter-ethnic confrontations. Enter Wang Zhengwei. Wang, a Hui from Ningxia, as the head of the SEAC, has spearheaded an effort to introduce more consistency in the licensing of halal food. Wang’s efforts have generated an unusual debate in the Chinese Internet: whether a socialist state can legislate in accordance with a religious law. Although China’s legal system has facilitated private transactions over the past 30 years, in many areas of public law the PRC is still very much a socialist legal system. It does not recognize religious law including sharia, although Article 36 of the PRC Constitution does provide for “freedom of religious belief.” In practice, however, CCP rules, not state law, determine the boundaries of what qualifies as “religion” and the extent of its “freedom.” Nonetheless, the debate that ensued over the Internet and social media lodged its arguments often in constitutional language. Conservative voices, such as Xi Wuyi, a scholar of Marxism at the Chinese Academy of Social Sciences, opposed the halal food law. Detractors feared that such legislation eroded the division between church and state, and endangered China’s national security. Opponents further argued that the constitution could not endorse tenets of Islamic law. More extreme views saw the law as a Trojan horse that would expose the Chinese government to Islamization and would force Han Chinese to follow Islamic law. They sought a rethinking of foreign policies that they believed went too far in opening China up to the Muslim world. On the other side, Lu Nan, an assistant professor of comparative law at Tsinghua University Law School, weighed the capacity to follow one’s religious law, what he saw as the kernel of religious freedom, as guaranteed by the Constitution, against a presumed violation of church and state, and found that the proposed legislation did not transgress this principle. These debates reached the highest levels of government. At last March’s “two meetings” of the NPC and the Chinese People’s Political Consultative Conference, an advisory organ, officials appear to have initially considered the halal food law. The law was included on the agenda of the 2016 Legislative Work Plan of the State Council, the highest administrative body in the country, yet was subsequently deleted. Likewise, the National Religious Work Meeting – held in Beijing on April 22 to 23 and attended by Xi, premier Li Keqiang, and other top-ranking leaders – appears to have discussed the issue as well. Xi seemed to close the matter during that meeting when he stated, we “must persist in the separation of church and state, persist in preventing religion from interfering with administration, judiciary, education, and other such state functions.” Five days later, on April 28, Wang Zhengwei was removed from his post. Although explanations abound in Chinese social media for his fall, one majority view is that he was pushing too hard to advance China’s first national legislation on halal food. As China increases its presence in Muslim states and links between its Muslim minorities and co-religionists deepen, it is only likely that these sorts of conflicts of law will increase. Previous constitutional debates have centered on issues such as property rights or certain forms of detention. The framing of the question of halal food legislation as a constitutional matter raises for the first time a question that pertains to religious minorities. At the same time, the scuttling of the draft legislation suggests that conservative voices have largely won the day. It is too soon to say whether this recent debate signals an Islamophobic turn in the highest levels of the government. The PRC’s treatment of its own Muslims will reflect on the leadership’s ability to connect with counterparts in the Middle East and elsewhere. Meanwhile, legislation struggles to keep up with the dynamics of an externally Muslim-friendly PRC and an internally discordant one. Here, then, is the Hui official’s dilemma: how to prevent the misuse of the sign of halal in a system that does not recognize sharia. Against a backdrop of near global hysteria about sharia, the leadership will have to carefully weigh its commitments to socialist law against the needs of its increasingly visible Muslim citizens.